The 4th lord of Hikone, Naoki Ii, ordered the construction of this temple by the same carpenter who had repaired Nikko Tosho-gu, a famous temple in Tochigi Prefecture. 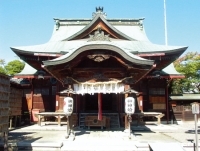 With its elegant architecture, in which the main hall shares a roof with the other halls has given Ohara Benzaiten Choju-in Temple the nickname of "Hikone's Nikko." A visit to this shrine is said to give to pilgrims the worth of a virtuous deed equal to a pilgrimage to 381 temple locations. Ohara Benzaiten Choju-in Temple's temple gate also forms a picture frame with straight-on view of Hikone Castle.